Move the classical tool bar to top of the flipping inner panel? Are you using the template of Classical? Are you fed up with the bottom tool bar? Whether do you want to move it to the top place? 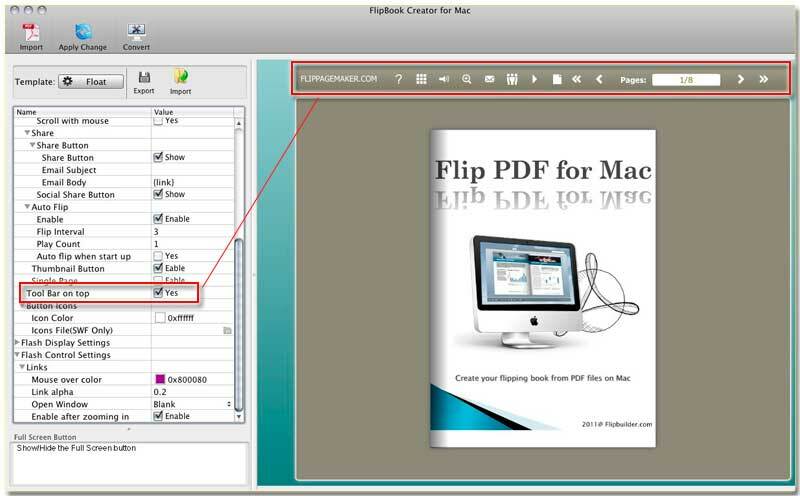 FlipBook Creator for MAC allows you control the flipping panel pattern completely. The output pattern is arranged by you definitely. Of course, the position of the menu tool bar just is the one of elements which can be moved. Just check the option of Tool Bar on top, and then click the top button of Apply Change. Step1: Start FlipBook Creator for MAC, and then move your eye to the settings on the left. Step2: There are many settings listed there, you should seek for Tool Bar on top, and then select it. Step3: To apply the change to the right flash flipbook, you have to click the top button of Apply Change.